Do you have a space in your home which is uninspired or underutilized because the materials used and the design make it an uncomfortable? Such was the case for Josefa Soto and Charlie Fabb with the room in the back of their home. The space was basically a “3 season room” gone bad! Charlie and Josefa didn’t just want any old functional room though – they wanted a space with which would show their interests and personality with some drama to capture the eye. See below 3 key steps Charlie and Josefa, with the help of Susan and Bob Dyas of Epic Group Ohio, used to transform this space into a fun and functional studio and office. This window not only provides privacy and light but also splashes of color into the room. How cool is that! Step 1 – Redesigning the space – In the old room design the rear wall (which is positioned as the feature wall) was filled with large energy inefficient windows and a door. The new design embraced the back (east facing) wall as the focal point of the room. Beautiful custom cabinets were added to house the couples books, extensive record collection and office supplies. A sense of fun and colored light was added with the use of an eye-popping colored glass block transom (more on this feature later). Step 2 – Make it comfortable – The reality is it’s no fun going into a room in with no insulation in the walls if you live in Ohio! When the contractor (Epic Group Ohio) demoed the room they added insulation, air ducts and energy efficient casement windows and a door (note – this new door now leads to a beautiful and low maintenance paver stone patio!). In addition new wood floors give the studio/office space additional warmth. Step 3 – Having fun with artist-inspired creativity! – Why settle for a same-old, same-old space when life is meant to be enjoyed? Josefa and Charlie both like art and entertainment which are celebrated in this room. Josefa loves the work of artist Piet Mondrian (an early 1900’s Dutch painter who used an art form called “neo impressionism and cubism” which consisted of 3 primary colors and horizontal black lines (note – Mondrian is regarded as the founder of modern art). 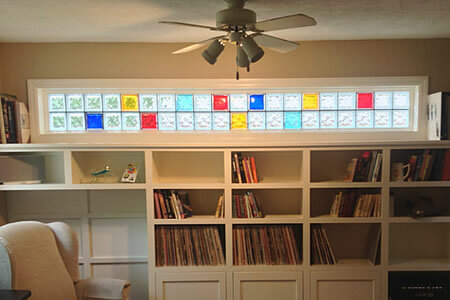 Josefa designed a colored glass block window which was installed and purchased from the Columbus Glass Block division of Innovate Building Solutions. This window used 4 colors (including butterscotch, cranberry, waves and cobalt) with black grout to capture the feeling of Mondrian’s work. If you are interested in a remodeling project in Columbus contact Bob and Susan Dyas at Epic Group Ohio at 614-314-9063. If you’re interested in inspiring colored glass block design call Innovate Building Solutions or their Columbus Glass Block division at 614-252-5888 or for nationwide wholesale supply at 877-668-5888.